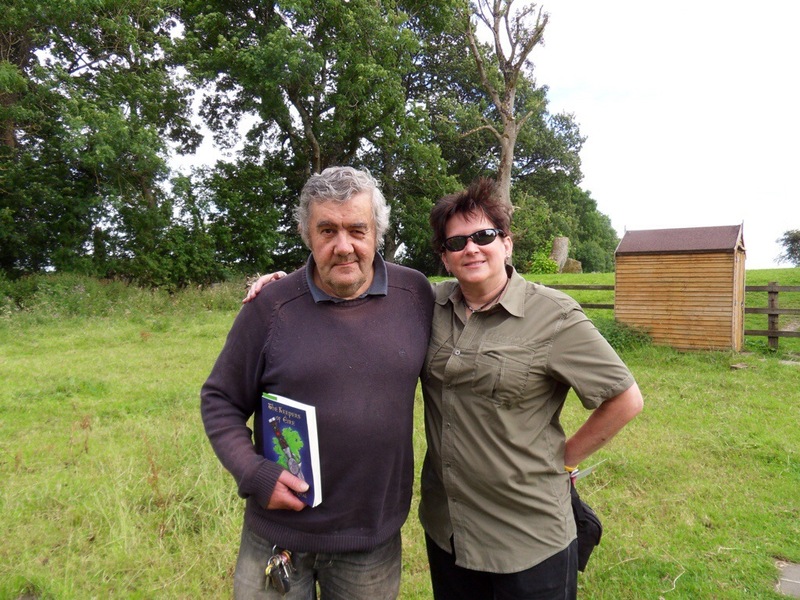 After leaving a copy of The Keepers of Eire at Waterstones in Cork City, I headed out to County Limerick and the Grange Stone Circle to find the circle caretaker, Timothy Casey. I met Timothy the last time I was in Ireland-we exchanged postcards. My Irish luck held well as Timothy pulled up in his tractor just as I was thinking of trying the house across the road (he told me last time that he lived just across the road). Here are Timothy & I. Those who have read my novel know that I have a caretaker for dragons that I named Timothy, after this wonderful gentleman. 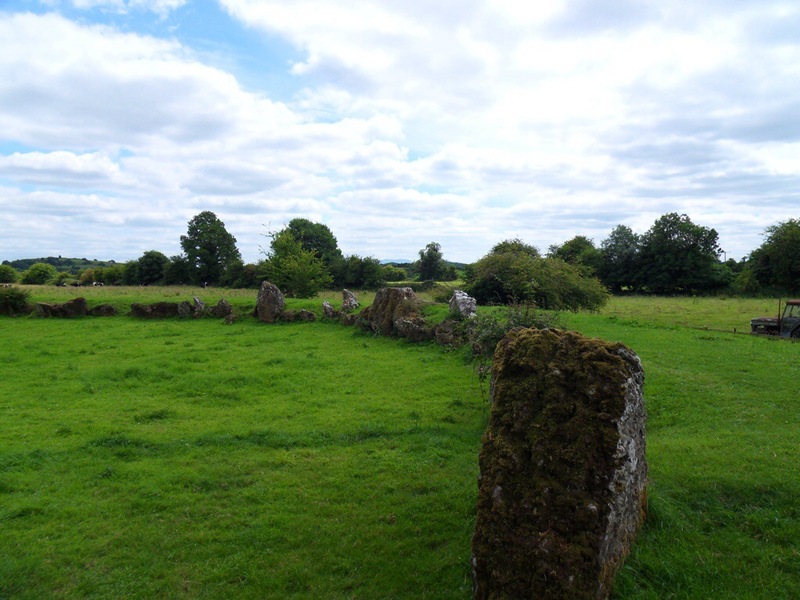 Here are a few shots at the stone circle. Guess who made an appearance today? 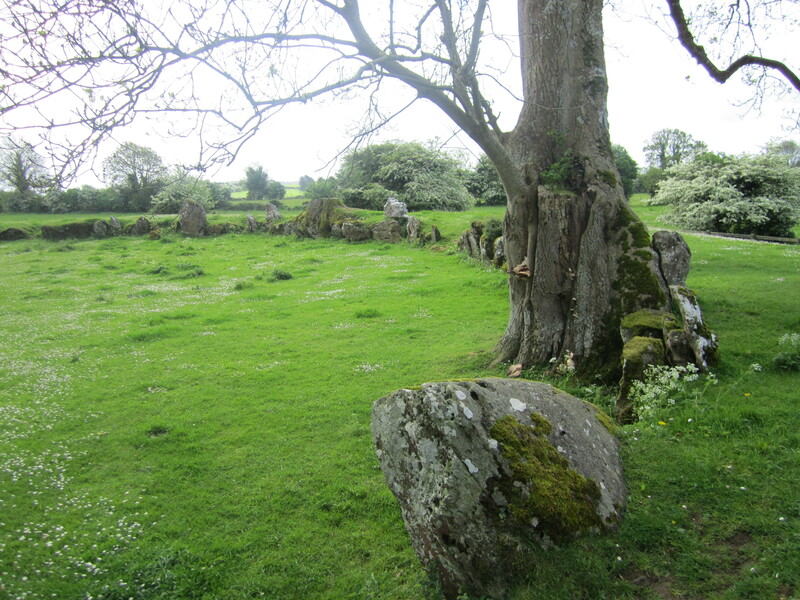 I just love this stone circle-such magic here, at least for me. Next, I headed toward my resting place for the night-Doolin, but I stopped in Lehinch and dropped off a book there, then spent some rain-free time at the Cliffs of Moher. Quite different from the last time I saw them. Yesterday was Imbolc, the Celtic holiday celebrating the Goddess Bride or Brigit. Imbolc refers to the lactation of ewes, the flow of milk that heralds the return of the spring, the signs of new life beginning to appear. 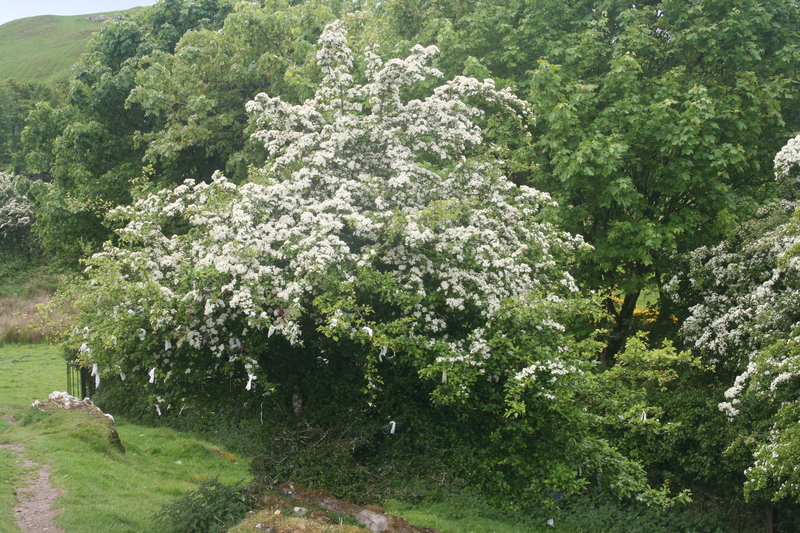 The lone hawthorn’s white blooms billowed in the brisk sea breeze. A pungent scent like sweet, decaying flesh mixed with the salty tang. Gnarled branches wove up from the bark-rough trunk, twisting toward the cobalt sky. Pastel colored ribbons tied on each branch nub waved like lace handkerchiefs from the dainty fingers of tearful brides. 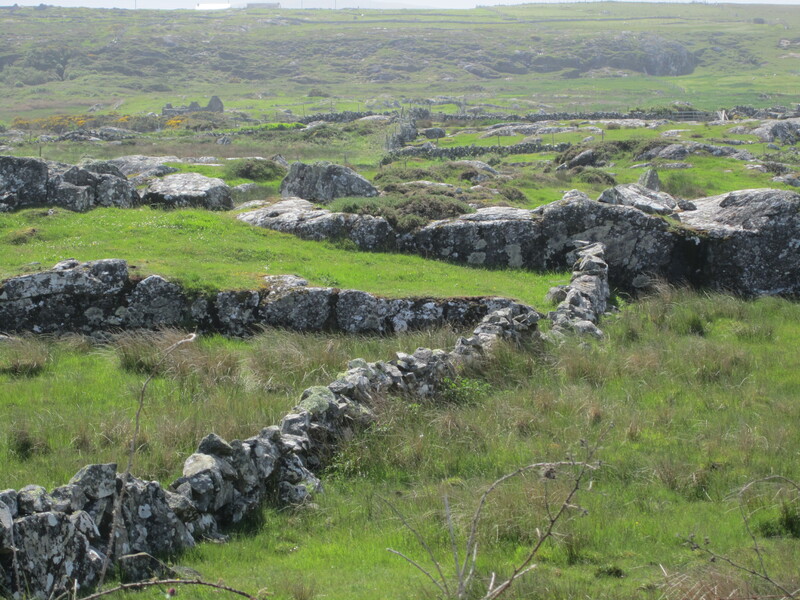 Low stone walls crisscross the emerald green pastures like a well-played chess board. Castles, horse farms, monastic ruins, stone circles, and burial tombs for long-ago kings and queens lay scattered over the land. Thatched roof houses and music infused pubs are as common as pawns. Sheep bleat and cows moo to the tune of the wind and waves crashing against the rugged Cliffs of Moher. Gray storm clouds and heavy splatters of rain intermix with cobalt blue and white StayPuff marshmallow filled skies to form rainbows with pots of gold at each end. 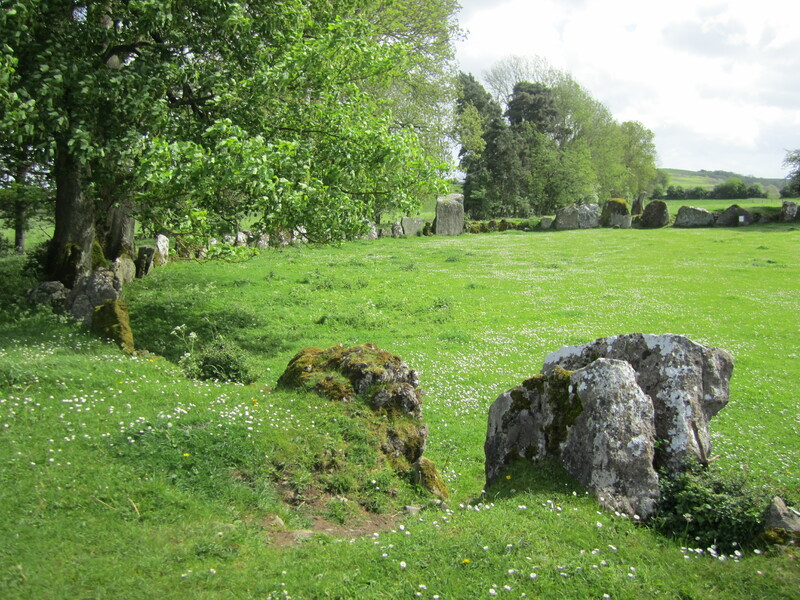 I backtracked into County Limerick so I could understand the terrain at Lough Gur, where the Tuatha dragons and clan members from Munster & Connaught Provinces reside. 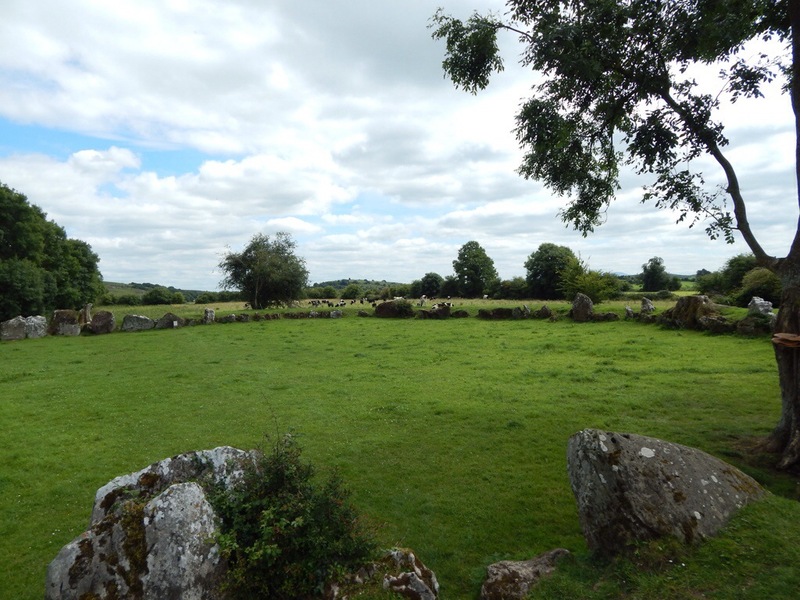 Besides the large lake (lough), there is a small community, the Grange Stone Circle- which is the largest in the Republic of Ireland with 113 stones and an overall diameter of 64 meters. The tallest stone faces north and two openings are situated east & west. 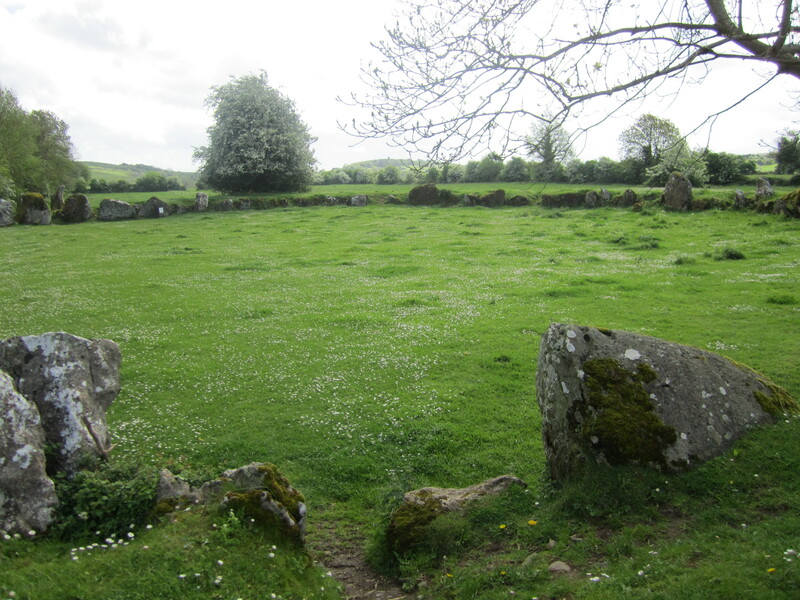 The circle was used as a calendar, with the rising sun aligned through the east/west openings on the summer solstice. Tried to get these photos side-by-side, but I think you’ll get the idea. 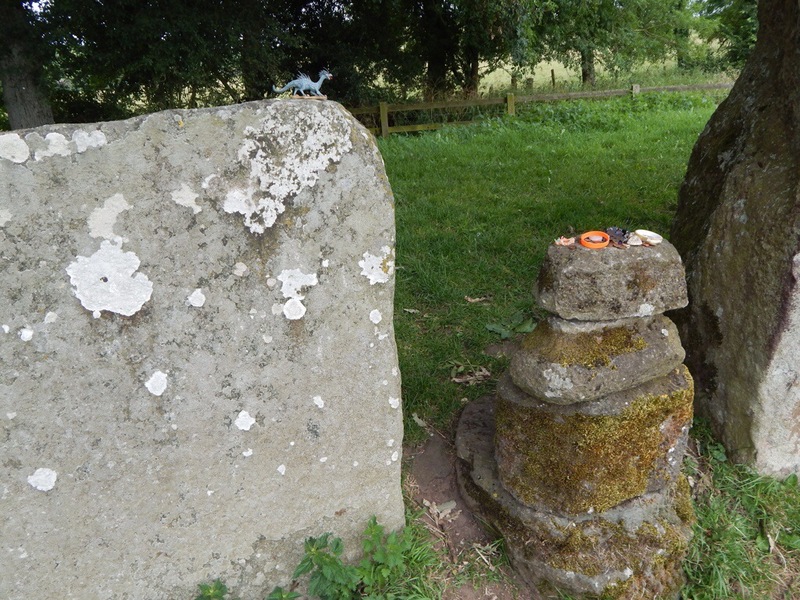 While investigating the site, I ran across an elderly gentleman recycling his bottles & cans for the week at the recycler at the visitor’s center, Timothy, the Grange Stone Circle caretaker. We exchanged postcards and talked extensively about the area. Now I have a better idea when to place the clan compound. I then proceeded back to County Clare. 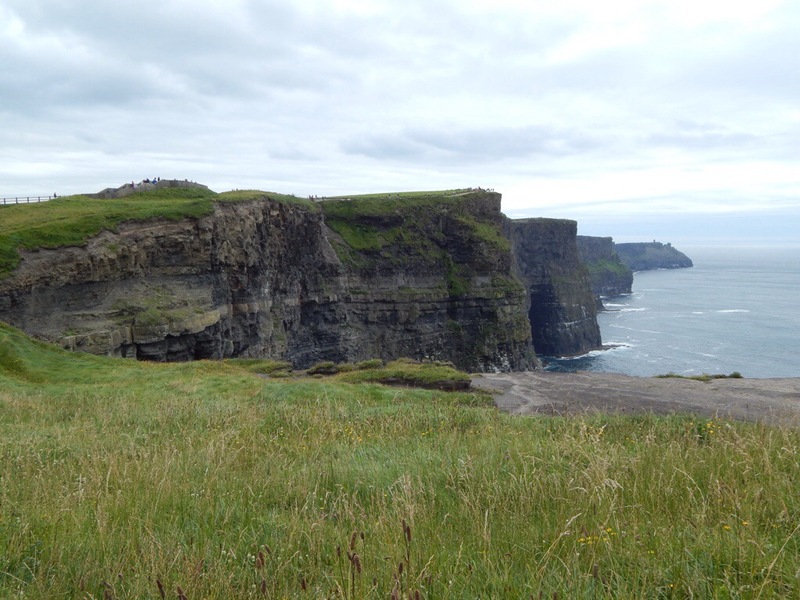 I stopped at Drumoland Castle (pronounced Drum O’lainn) and the coastline at Kilkee and Loop Head. 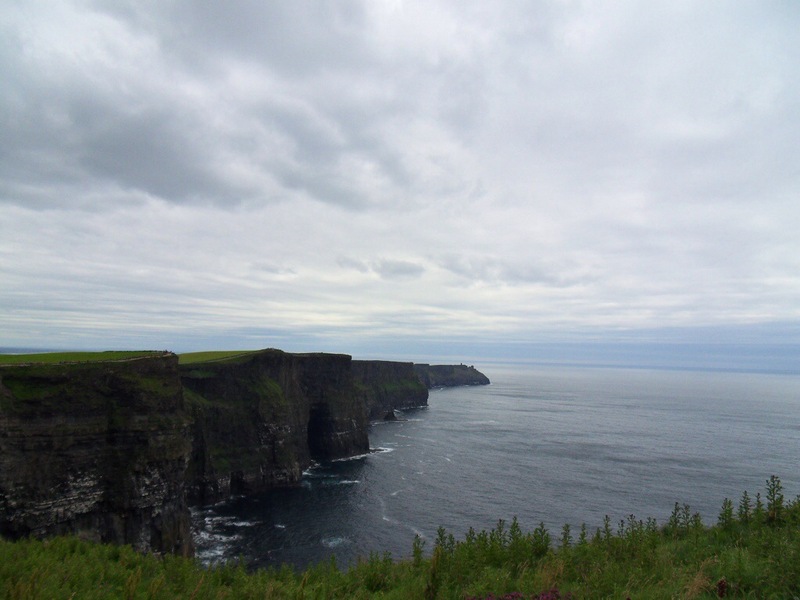 The Cliffs of Moher were my final stop before finding a resting place in Doolin. The weather is what the locals call: Sunny spells with scattered showers!! 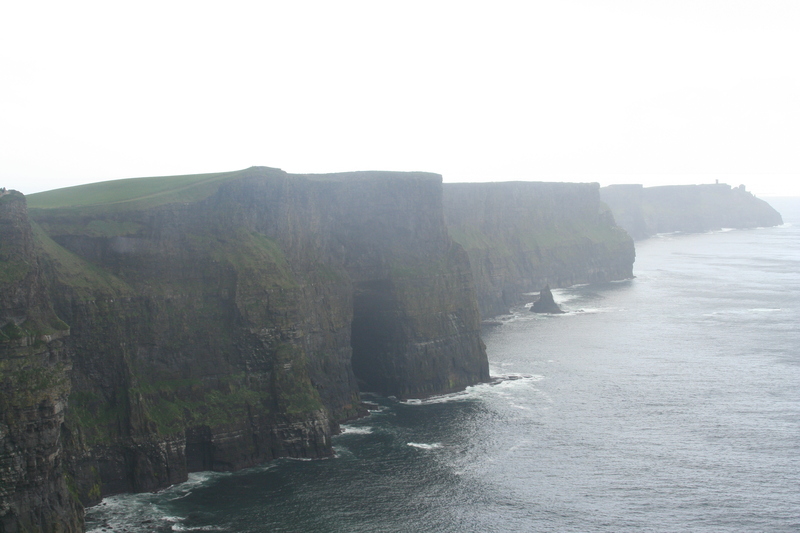 The views from the Cliffs of Moher were awesome. The sun peaked out sporatically, but the wind gusts were constant.